The ancient city of Petra is buried within the desert of Jordan approximately 240km from Amman. The Pink City, so-called because of the dusky-pink rock face, was unknown to the Western world until it was discovered in 1812. This isn’t the only reason why this lost city of Petra is now one of the new 7 wonders of the world. Read on to find out why and have a flick through the gallery above to discover the magic. Spending an evening immersed in a traditional Bedouin camp full of colour, warmth and generosity and a night under a stunning star-studded sky was unforgettable. Hospitality and a love for their beautiful lands is truly at the heart of Bedouin culture. 7am sees our group clambering into 4×4 trucks and setting off into the desert towards Petra. The early start is made easier by the sight of the sun warming the sand and rocks to give them a glorious golden glow. Our route took us bumping and bouncing through the desert in Wadi Arabia. It wasn’t the comfiest of rides, we came up with a few techniques on how to position ourselves in the back of the truck especially when we took a bump at speed, the adventure was too hard to refuse though. Petra, a UNESCO World Heritage Centre is one of the most important archeological sites in the world. 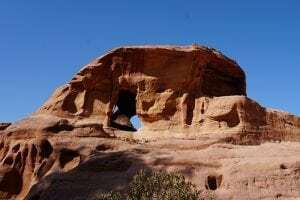 The city, part ‘built’ and part carved out of rock has been inhabited since prehistoric times and saw occupation and development by the Nabateans, Greeks and Romans. 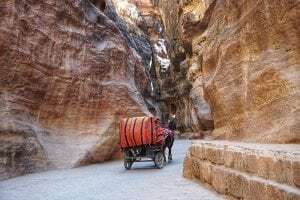 Since UNESCO awarded Petra with world heritage status in 1985, the Jordanian government forced the Bdouls, the largest Bedouin tribe in Wadi Musa, out of the caves to protect the archaeological site. Purpose-built ‘Bedouin Village’ dwellings were created known as Umm Sayhoun, where most still live today. Trekking through the quieter ‘back door’ of Petra, as we did, allowed us the time and peace to enjoy the fantastic views over Wadi Arabia. ‘Wadi’ is an Arabic word for a valley or an, often dry, riverbed. Magnificent rocks and mountains jut into an endless sky and sand dunes of gold, ochre and red undulate to the horizon. Just breath-taking! We passed a few Bedouins along the way with their donkeys, we fed them the cucumbers, tomatoes and sandwiches from our packed lunch and got on our merry way. Turning a corner and suddenly being greeted by The Monastery high above us makes us all stand and stare in absolute awe. This 3rd century BC building was given its’ name by the crosses carved into the inside walls which suggest use as an ancient church. The Hellenistic (Greek) frontage looks almost as though it is part of the mountain. The colours and textures blend together in the sunlight. It’s just mind blowing to realise that my walking boots are kicking up dust where our most ancient, most forward thinking, culture creating and most influential ancestors stood. There is history and beauty in every rugged inch of the vibrant pink, red and white sandstone that towers above us. There’s a café directly in front of the Monastery where you can grab a cup of tea and take in the magic of Petra. It is rare to be able to refuel in such awesome surroundings. If you’re feeling the effects of the sun, you can buy the Bedouin red and white scarves to protect yourself, they will help you wrap it around your head for the authentic experience. Getting closer requires a walk down precariously and quirkily eroded paths and steps lined with Bedouin souvenir stalls and views outwards towards Israel, Palestinian territory and the peak of Jebel Haroun. Each entrepreneurial stall owner has learnt some English phrase to get you over “Looking is free” or “No money, no honey” and many offers from boys on donkeys shouting “Ferrari” to entice us to relieve our weary feet. Next stop in this magical city was the Royal Tombs of Petra – the Urn Tomb, the Silk Tomb, the Corinthian Tomb and the Palace Tomb – are situated across from the Roman Theatre looking down on the main walkway. To reach them you have to climb a stairway that leads to the famous Urn Tomb, which was used as a place of worship during the Byzantine Empire. Now for the Treasury which is the most iconic part of Petra thanks, in part, to an appearance in the iconic movie Indiana Jones and the Last Crusade. However, it’s impossible for any traveller to think of this vast monument of astounding architecture as just a film set. The Treasury, Al-Khazneh in Arabic, was built around the 1st century BC by King Areta III Philhellene. He was a lover of all things Greek and The Treasury is heavily influenced by his passion. Lions, the goddess Isis, Winged Victories, majestic columns and urns adorn the facade. I’m amazed by how well preserved this sculpture of rock actually is. The carvings are set deep into the cliff so that wind and rain haven’t been able to take their toll. There are imperfections of course, but these reminders of Petra’s extraordinary age simply intensify the impact of one of the Seven Wonders of the World. Passing through the exit of the Pink City of Petra, the high narrow channel in the rock known as The Siq feels as though we are leaving an entirely separate universe behind us. Looking back over my shoulder, I can still see the afternoon light making The Treasury appear as though it’s glowing. 2000 years of time travel is easier than you think in Petra. Just takes a few steps, well, maybe a few more but worth every single one of them! The Jordan Pass is a cost-effective way of exploring the wonders of Jordan. For one pre-paid fee you can have access to 40 different places of beauty and interest. Operated by The Ministry of Tourism and Antiquities this great value pass can be paid for before entry to Jordan. As long as your trip is for at least three days your tourist entry visa fee will be waived on production of your pass. Comprehensive digital guide books are included in the price, no more heavy books to carry! A pass for a 3-day pass costs only $113. Petra opening times are from 6.30am to 5pm and you can hang around until they try and clear you out at sunset. If you’ve been to Petra, tell me your tips and feedback in the comments below. If you’ve not been, I highly recommend you do. Kosan Travel Pack: Every Backpackers Dream! To stand, sit and even enjoy a coffee surrounded by such amazing and ancient history must be an incredibly mind blowing experience. The Petra’s have been on my list since I was 6, think it’s time I stop eating cookies and use the money to get there for real! Awesome post! It’s definitely worth a couple of months off the cookies to save up some cash to see this beauty – it will be everything you imagined and more!